This stunning looking dog originates from Germany and is a membver of the Spitz family of dogs. Spitz type dogs, or nordic breeds, as they are also called, even they were borned on different continents, they all have their origins in North, in a cold climate, harsh, which caused the surviving at only healthy, sturdy specimens. Generally they have mani similarities: the bushy, double fur, the sharp ears, the tail sharp and bent on the back. 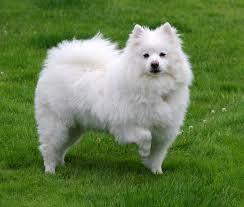 They bear a likeness to the Danish Spitz, Japanese Spitz, Volpino Italiano, Samoyed and German Spitz. It's common name is the 'Eskie" and the beautiful black eyes really stand out against the white coat. Originally bred to guard both people and property, it can be territorial in nautre and is a good watchdog, barking, rather than being aggressive to warn about possible intruders. The American Eskimo Dog was originally bred to guard people and property and, therefore, is territorial by nature and a valiant watchdog. It is not considered an aggressive breed but, due to its watchdog history, American Eskimo dogs are generally quite vocal, barking at any stranger who comes in proximity to their owners' territory. This dog can be found in three sizes, the toy, the miniature and the standard. In the 1930's and 40's they were widely used in circuses, doing various tricks and was the first known dog to walk on a tightrope. They are very intelligent dogs and learn easily. They are great family dogs and love to show off, and be part of all the family activieties. Overall they are friendly with people they know, but can be she/reserved with strangers, so attending puppy socialization will help with this, as well as on-going socialization. They are very bright and easy to train, but do require a lot of exercise and do better with a more experienced owner. Due to their intelligence, they can become bored and engage in appropriate behaviours and exhibit over the top behaviours. They love to work and are known to do very well in obedience work, agility and also Dog Dancing and Tricks. They are known for excessive barking, especially if bored and frustrated or left alone. If you dont like brushing a dog or taking the time to do so, then this breed is not for you. It has a double coat with a dense undercoat and longer outer coat and sheds a lot. This breed requires both physical stimulation by way of daily walks and games of throwing objects, and due to its intelligence, it is a good idea to supply mental stimulation by way of tricks, scent mats and trails in the garden, behaviour puzzles and the like. If you are going to leave this dog alone all day while you are at work, also not a breed for you. They love company and being part of the family. This breed will need a large and fenced garden in order to run and be played with. ​It is easy to train, but can be stubborn and difficult and is better suited for a slightly more experienced owner, rather than a beginner. Their priority in life is their people, but is well socialized from a pup with on-going socialization, they will tolerate other dogs. They are a breed that is not known for aggression, in general. As with most of the Spitz type breed, they do not do well with small animals, and the natural prey drive will take over. They are excellent with children because of the dog's high intelligence and its willingness to please,but can become a bit bositerous, so be aware of them around small children. Overall they are healthy dogs. Some of the health issues that can affect this breed are PRA (Progressive Retinal Atrophy, Hip Dysplasia, Luxating Patella and on occasion Diabetes.